There are more photos on our old News page, our blog, and on our Facebook page (click the link in the column on the right). Helena rowing back towards Christchurch Harbour on the sunny 2nd of October 2011, after our second 24. She forgot her rowing gloves, which is why she's got socks on her hands! Richard rowing near Bournemouth on our first 24 hr practice row.Hopefully we won't pass any big ships as close as the one in the background once we're out on the ocean. 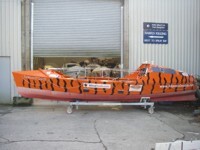 Didi was delivered to the Woodvale yard in Totnes ready for transportation out to the start in La Gomera. Don't drop her! 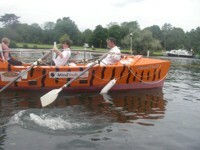 Didi being taken off the water in Henley. The beautiful slipper launch in the background is probably a similar length - but wouldn't last long out on the ocean. Richard's colleagues from the maths department of Kingston Grammar School were fascinated by the boat when R brought her to the staff BBQ at the end of the Summer Term 2011. Friends rowing Did at Henley 2011. She'll be a lot lower in the water during the race as all of the food and equipment weigh a lot more than the 2 passengers on board at this point! at sea, but probably not water this flat! Helena rowing on Coniston at night, during our 24hr "trial" in Beech Boys Atlantic, August 2010. Richard on Coniston in daylight. Hopefully the open ocean will require a bit less looking round to check you're not about to hit anything. However, note that the sound of the oars is surprisingly pleasantly soothing. Dan, Rachael, Richard, Helena and Andy during the 5-day, 205km Rallye du Canal du Midi in August 2009, after lunch. And shortly after. We're hoping that the waters of the Atlantic might be somewhat cleaner! Helena peeping out at bow during the Tour du Leman a l'Aviron 2006. 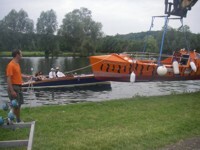 Helena at bow during the Tour du Leman 2009. Helena coxing York City to win the Brit at Henley in 2007. York City Rowing Club - Britannia Challenge Cup 2007. 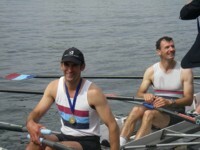 Richard at Marlow Regatta 2006. And 2010 (on the left). York City Rowing Club - runners up in the Yorkshire Sports Awards 2006. 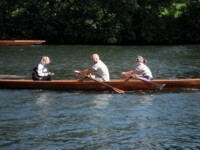 Skiffing - how Helena does much of her training.